Who Recognizes Palestine in 2013? Palestine is now an Observer State in the U.N., but it's still not recognized individually by all U.N. member countries. Read on for more about the latest countries to recognize Palestine, plus other recent changes to its international status. Countries recognizing the State of Palestine in green, with most recent additions highlighted in lighter green. 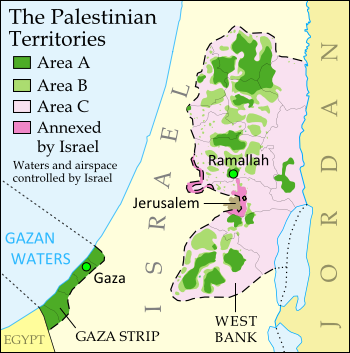 Palestine in magenta (circled). Map by Evan Centanni, modified from public domain graphic (source). Despite opposition from Israel, the U.S., and other Western countries, Palestine was recognized as an Observer State by the U.N. last year. However, recognition by individual countries is a separate matter. In September of 2011 we reported that the declared State of Palestine had accumulated recognition from 126 U.N. members plus partially-recognized Western Sahara. But have more states recognized Palestine as an independent country since then? Yes, a few. As highlighted on the map above, several more U.N. member countries have recognized the State of Palestine over the last year and a half. New additions since our previous update are the Caribbean island nations of Dominica, Antigua and Barbuda, and Grenada, plus Thailand in Southeast Asia and Iceland in Europe. The latest, recognizing Palestine for the first time just last month, is the Central American state of Guatemala. This brings the total number of U.N. members that consider Palestine a sovereign state to 132, or about 68 percent. Or could it be more? Last year, before Guatemala's announcement, the Palestinian government was already claiming recognition from 132 countries, and the U.N. resolution which made it an Observer State mention that Palestine was already recognized by 132 "members of the United Nations". However, no additional recognitions have emerged in the months since then, so it seems likely that it was an error. The number 132 probably refers to the 131 U.N. members recognizing at the time, plus Western Sahara. Also since our September 2011 report, Palestine was accepted as a member of the United Nations Educational, Scientific and Cultural Organization (UNESCO), a specialized agency of the U.N. This happened before its elevation to Observer State status in the General Assembly, and was quite controversial at the time. It was speculated that becoming an Observer State would increase the likelihood of Palestine being accepted into more U.N. organizations in the future - however, this has not yet happened. Another change to Palestine's treatment internationally came with a February 2013 update to the standard list of country codes and names from the International Organization for Standardization (ISO). This standard, which is used by many organizations and companies around the world, is tied to official United Nations usage. After the Palestinian government received Observer State status from the U.N., its name was changed in the standard from "the Occupied Palestinian Territory" to "the State of Palestine". Online company Google caused a bit of a stir last week when it changed the name of its Palestinian search page from "Palestinian Territories" to "Palestine", receiving criticism from the Israeli government. However, Google argued that it was not making a political statement, but only following the lead of the U.N. and the standard used by websites around the world. Check For Updates: See more recent recognition reports by viewing all Palestine posts. Palestine Recognized as a Country by U.N.